BB80 – Who is listening to who? BB80 – CCP Seagull encourages everyone to get involved in CSM12. Blogger Neville Smit noted that CSM11 had done a good job with minimum drama, but with only 10 seats available in CSM12 the Null Sec power-blocs will likely take them all. Is he right and will it be a good or bad thing? I liked the concept of the CSM. I thought it could engage the player base, channel good ideas into CCP, and filter out some of their bad ideas. I remained optimistic for a long time, but that is no longer the case. I think I was pretty naive. To me the mechanism never seemed to live up to its potential. The CSM members often lacked the personality or skills to be effective advocates. EVE Players attacked their own representatives and gamed and damaged the systems that had been put in place. CCP already seemed set in the direction they wanted to take the game, and only really gave lip service to the CSM. I assume this lack of impact or influence helped fuel the apparent adversarial relationship between the CSM and CCP. Even given my perception, I still got value out of the CSM. I liked the flow of information it prompted, both on updates in the pipeline and the general discussion on feature ideas and impacts. In particular, I have read all CSM Summit meeting notes from cover to cover. I could still generally find something to be excited about, and thank the CSM process for the heads up. In the CSM11 Summit notes I was struck by how much more cordial the relationship seemed between the CSM and CCP. Some years you could feel the palpable friction, but not with CSM11. It seemed so much more productive. Why? The largest part of CSM11 were Null Sec representatives. Have they been able to marshal the considerable resources of their Alliances to be more organised, professional and influential? Did Null Sec put forward the best of themselves? Did they do a better job of persuading CCP towards their ideas? It seems logical from previous year results that most of the top 10 winners in CSM12 will be from Null Sec. I think Neville will be right in that regard. Does it matter? Might it even be favorable? Reading the last Summit notes I think the answer became more apparent. There were disagreements and hard questions from the CSM to CCP, must mostly I got the impression they were on the same wavelength. Was this because CCP suddenly became more flexible in the direction they were taking the game? Did CSM11 feel happier because they were more influential? Or – was it that CSM11 agreed more with what CCP was already doing? I have felt for some years that CCP is focused on a type of conflict in game which makes it easier for the stronger to crush the weaker. The sort of changes the powerful Null Sec groups are more likely to be happier with. I don’t think it really matters what happens with CSM12. CCP will do what they already planned to do, and the only difference will be the facade cast over the CSM12 term. It will appear productive if they agree with CCP, unproductive if they don’t. Other Blog Banter posts on this topic can be found here. BB78 – Should CCP put effort in to reward long term loyal customers? Is this lack of gratitude towards loyal customers alienating? Do people wish for a change here? Is it too self-righteous to expect small signs of gratitude for being a loyal customer? Or is it just a case of there is no need and HTFU snowflake? For quite a while l liked the idea of some special memento or similar to acknowledge in game the number of years someone has been playing EVE. Nothing that can be monetarised. A POD or ship skin that is automatically injected, or medals you can choose to show or not, maybe access to some unique station without services or an unusual system that has no resources you can take. Some sort of official acknowledgement of the longevity with a cool novelty factor but otherwise no impact on the game. When I first heard such suggestions it seemed to be readily supported. With time however now I hear just as many dissenters. It wouldn’t be fair on younger players, or new players; old players already have too many toys, we would need to ensure it only went to active players not just those who pay their subscriptions, and so on. I must have missed the in-game release of the new Super Capital “EVE is Fair”. Just make it very simple – add up the time an account is active (either paid or through PLEX), and when they reach milestone years give some sort of token to the highest SP character on the account. It doesn’t matter if they spent the entire time AFK, or constantly generated in game content, they have been around and financially contributing to the running of the game. Let them feel like a special little snowflake for a few minutes. Let them stop and reflect on how many years they have wasted. Do I think this is really necessary? No. Do I think it might encourage people to stay subscribed for longer? I doubt it. Then why? It is one more little bit of cool or interest added to the game, which some players will get a kick out of and enjoy. BB73 – With EVE, Valkyrie, Gunjack and the sometime in future DUST replacement, is there any other area CCP should be looking to expand the EVE universe into? I am not sure it is appropriate to ask this question yet. EVE will be turning 13 in May this year. Across all those years CCP has only really managed to expand the EVE universe into an about to be shut down and barely successful console first person shooter, DUST 514. If you were feeling generous you might also add walking in Captain Quarters. That is however probably best left unsaid. Sure Gunjack and Valkyrie will soon be in the hands of early VR adopters. It might bring CCP great success. But that requires enough people to buy into the hardware, and for CCP to get the games just right for this new and untested market. It seems premature to classify these as a real part of the EVE universe just yet. 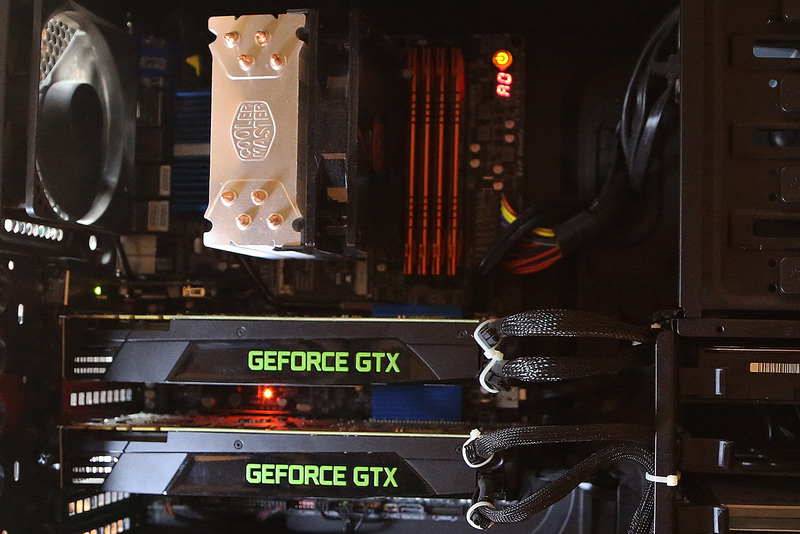 The same goes for the DUST 514 PC replacement – which we have sparse details on. While I commend CCP for trying to ensure they are not reliant on just one income stream, they have spent a lot of time (and I expect money) on expanding the EVE universe, but so far without notable success. At this point I don’t think CCP should be looking to add any new games – I expect they will be too busy focusing on juggling their current developments. The only “out of EVE Client” work I would like to see at the moment is a portal app for iOS and then Android. Allow us to read and send EVE Mails, update market orders, and even do Planetary Interaction on a tablet. Give us the option to keep connected to the game between running the full client. That’s not really an answer to the BB question – but I didn’t just want to write “No”, and leave it at that. BB 70 – Dear CCP Santa, All I want for my EVE Christmas is..
A variety of things flew across my mind when I first saw this Blog Banter – a reason for me to use the Rorqual, a reason to use the Bowhead, a reason to open the captain’s quarters, or any one of the dozens of things I’ve mentioned over the years in this blog. But in the end it came down to a simple and oft repeated request. I would like more tabs for my overview. Please. I know it should be possible – there were ways you could do it yourself in earlier years. If CCP Santa thought I was really good this year, I wouldn’t mind also being able to colour code the overview tabs. Again I know that is possible as I see other players doing it on YouTube videos. It would be nice if it was supported within the client. *EDIT* This is actually easy enough to do – Google is your friend. You just use the HTML color tag around the tab names. You can also use bold, italic and underline, possibly more. Last of all, if CCP Santa thought I was really, really good this year, I wouldn’t mind the notion of inheritance being introduced to Tab Presets. Currently it is painful maintaining every tab preset individually, such as when new ships are introduced. It would be nice to be able to set up a template which other tabs automatically inherit from, so that for things I want to see on every tab, I only need to make the change once. Wishing you a merry EVEmas. BB 68 – How do you play your important internet spaceships game? 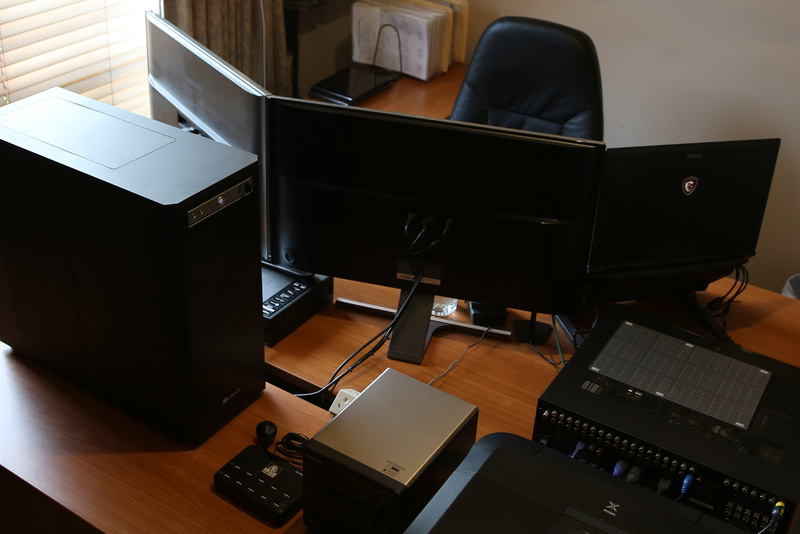 On a laptop, 12 monitor setup, 50” TV, amongst the family or locked away? I live in Melbourne, Australia. Unsurprisingly I play EVE in a Hermit Cave. My study door is kept closed to dull the noise from the family and keep the cats out. When I play I hunker down behind a couple large screens and attempt to hide from my reality and responsibilities. My desk is positioned to allow me to watch TV while playing EVE, and to split my attention between the screen and my wife when she pops her head through the door. Well – that was the intention. It sometimes works if she is just asking if I would like a cup of tea. More often however she appears to order me to do something out of my study, or she comes and stands next to my desk, forcing me to turn the chair to face her. In both scenarios I can’t watch my EVE session. If it is not her, it is the kids. As such I generally prefer to play EVE when I am the only one home, or everyone else has gone to bed. 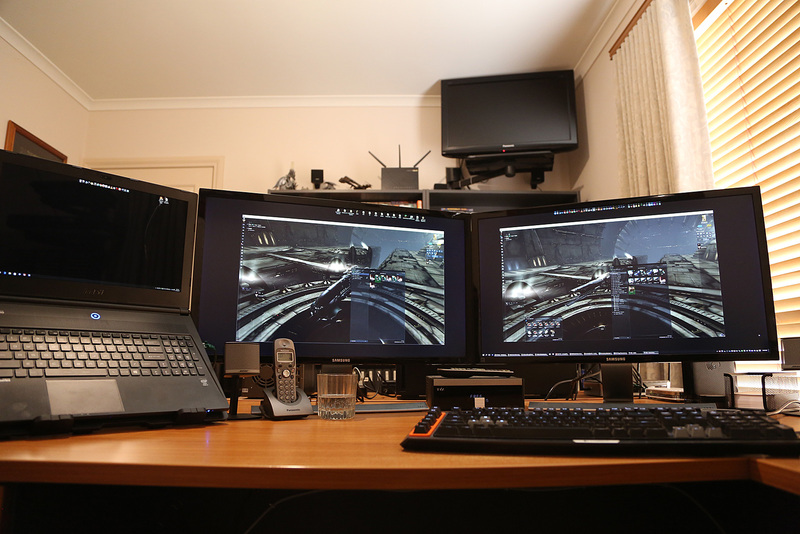 I run EVE on a custom built i7-3770, with 32GB Ram, SSD, Dual GTX 680, Dual Samsung 28” 4K Monitors and Windows 10. I generally use Logitech game keyboards – currently the mechanical G710+, and Steelseries Mouse. When travelling or as a backup, I run EVE on a MSI GS60 3K Ghost Pro laptop, which has an i7-4710HQ, 16GB Ram, SSD, GTX870M, 15.6” 3K Screen and Windows 10. 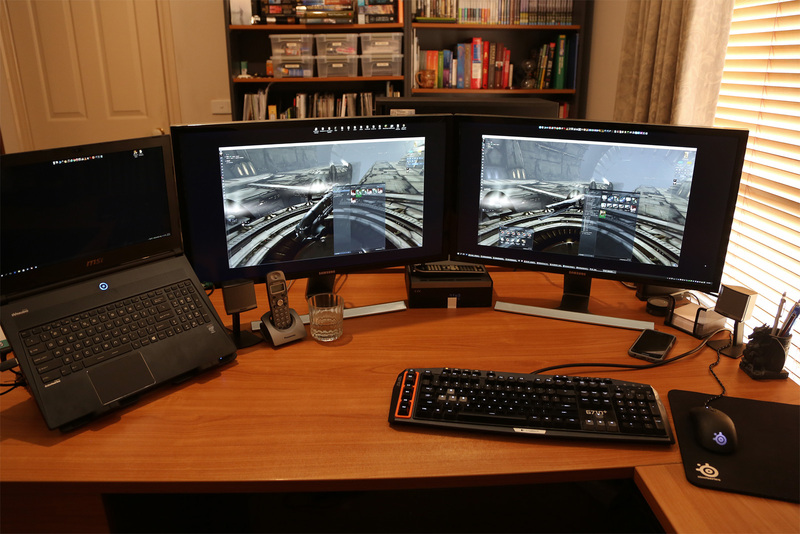 I can use my desktop keyboard and mouse to control the laptop via Stardock’s Multiplicity, so can use that as a third screen. Neither are cutting edge anymore, but can run both my accounts (on the desktop in a 3000×1800 window) without issue. I find EVE a frustrating game to play if I get interruptions. It is much more immersive when I can cocoon myself away, open my clients, open my EVE tools such as Excel, EFT and DOTLAN, and just lose myself in it. I suspect if I had more social interactions through the game that this sort of setup might be less important, but as it is, it seems to help me enjoy my solo style of play. My study is my equivalent of a man cave. While I don’t spend as much on technology as I did before kids, the room is set up relatively nicely. My wife generally takes the view that as I work from home and can spend 12+ hours a day in the room, it is appropriate to spend money setting it up properly. I don’t go crazy with my purchases, but over the space of 15 odd years it has slowly been upgraded and improved to the point where it is a nice place to spend time.